Old 4/5RANGERS's Colours being marched off before the presentation of new Colours; Belfast, 22 September 2018. Since ancient time, armies have carried an identifying emblem; the Aquila (eagle) of the Roman Legions and the Vexillum were carried as a flag-like standard by their Cohorts. In Ireland, a clan chief's banner (méirge) was carried into battle by a standard bearer. At the battle of Clontarf in 1014, Turlough, grandson of Brian Boru High King of Ireland, cut down the bearers of Norseman Sigurd’s raven standards until Sigurd too lay slain attempting to conceal his banner under his cloak. The Normans, as illustrated in the Bayeux Tapestry, continued that tradition of bearing the Norse god Odin’s ravens into battle. The medieval period saw their descendants blazoning heraldic devices and armorial bearings, as granted by the King and controlled by his Royal Heralds (College of Arms), on shields, helmet crests and banners. The soldier’s loyalty had been to his Knight or Lord but individual insignia disappeared as a demand for soldiers to swear an oath and pledge loyalty to their sovereign meant that such devices were replaced by the King’s flags or ‘Colours’. The use of the word Colours first appeared in 16th century Europe and came to be associated with the ‘King’s Flag’ which was described in ‘Regulations for the Uniform Clothing of the Marching Regiments of Foot, their Colours, Drums, Bells of Arms and Camp Colours, 1747’. This ordered the King’s, or First Colour, to be the ‘Great Union’ and the Second Colour’s field to be the colour of the ‘Facings’ of the regiment’s uniform. Collectively the two are known as a Stand of Colours. Woven in silk, their size is 3 foot and 9 inches across the ‘fly’ by 3 foot along the ‘hoist’. They are carried on a staff, which is 8 foot and 7 inches from tip to ferrule, and the cords of mixed crimson and gold are 3 foot long, the last 4 inches finishing as tassels. Unfortunately, Colonels of various regiments ignored such regulations and it became necessary to introduce stricter control. 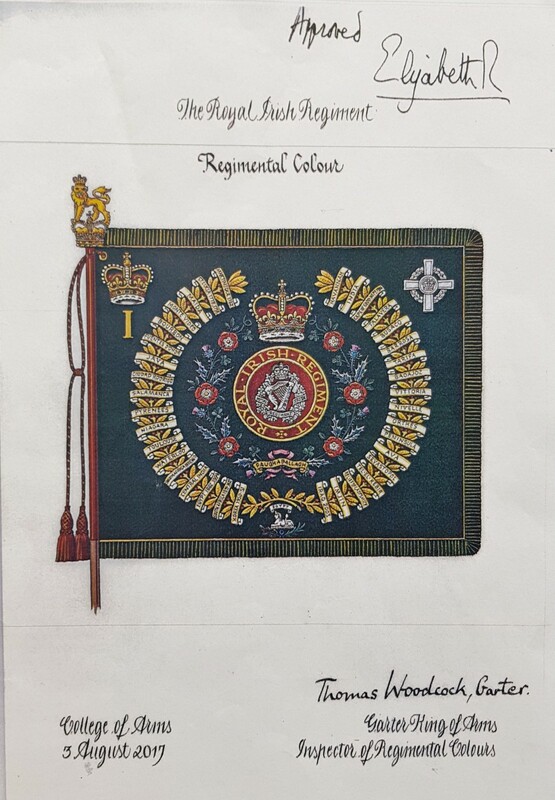 Therefore, the office of Inspector of Regimental Colours was instituted in 1806 in order to regulate the design of the various Colours, Guidons, and Standards of the Army. The first Inspector was Sir George Nayler (1764-1831), who later became Garter King of Arms. In 1811, the Prince Regent issued an order to regulate the Colours of the Army and sanctioned the custom of emblazoning them with Battle Honours to record glorious achievements in battle. Since that time the office of Inspector has normally been held by Garter King of Arms and as the Army's heraldic adviser he is responsible for approving all new designs for Colours. Today, the artwork for new designs is prepared at the College of Arms by a heraldic artist, signed by the Inspector, and then submitted to The Queen, via the Ministry of Defence, for formal approval. Once The Queen has signed the painting (right), it is returned to the College for safe keeping. This was the procedure followed for the design and production of the new Colours presented by HRH The Duke of York on Saturday 22 September 2018; to read about this event please click on Presentation of Colours 2018. 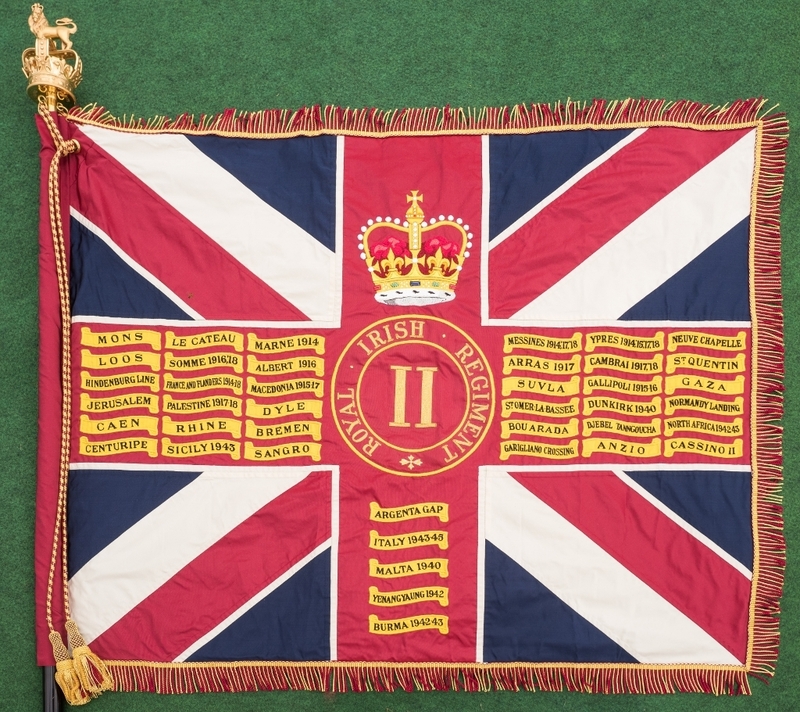 Colours were carried (guarded) into battle in the 18th and 19th century at the centre of the regiment. The King’s Colour took precedent and was carried to the right of the Regimental Colour. They were the point of reference around which infantry drill movements were performed to achieve various battle formations. The King’s Colour symbolised loyalty to the King and provided a rallying point in the heat of battle. Thus, Colours became the symbol of the spirit of the regiment with a moral and sentimental importance. A spiritual dimension was acknowledged by the religious act of consecration on presentation by the Sovereign. However, the changing nature of warfare meant that, by the 1880s Colours ceased to be carried into battle. Trooping the Colour through the ranks, a practice conducted prior to battle so that the Colours would be recognized throughout the Regiment, was thereafter performed only in peacetime. 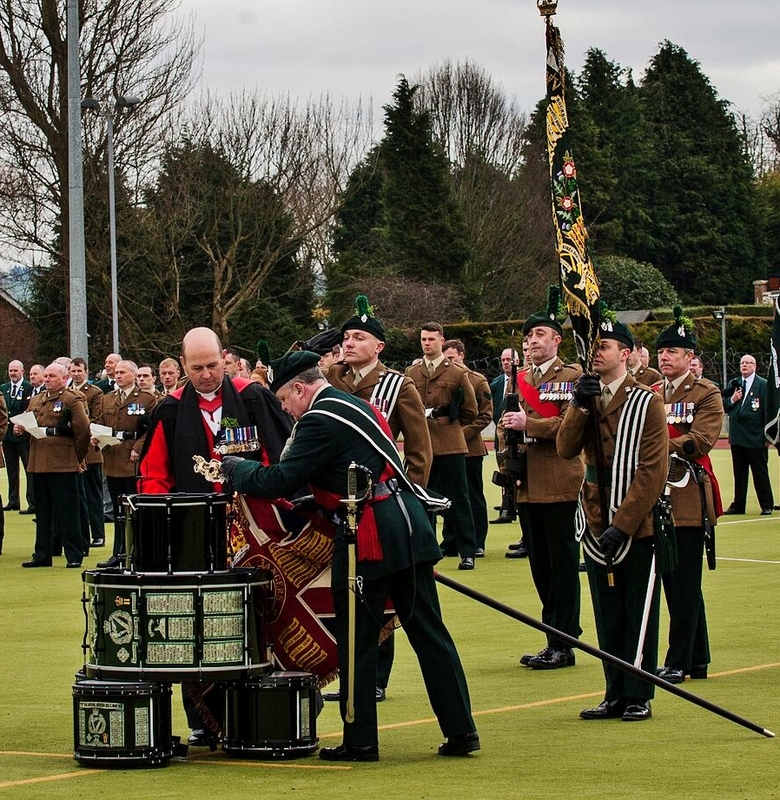 The Colours of The Royal Irish Regiment generally follow the layout directed by the 1747 regulations. They are emblazoned with selected campaign, theatre and battle honours commemorating gallant deeds by the Regiment’s forebears. The Queen's Colour (above left) carries honours from both the First and Second World War and The Regimental Colour others since MARTINIQUE 1762. 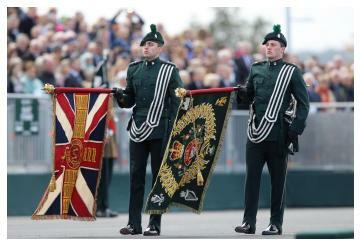 The green field of the Regimental Colour (left), reflecting the Regiment’s uniform ‘facing’, also has several distinctive devices. One is a Sphinx which commemorates service in Egypt during the Napoleonic wars and the other is the Conspicuous Gallantry Cross presented personally by The Queen in 2006 as a mark of the nation's esteem for service by the Regiment's Home Service battalions and their forebears in The Ulster Defence Regiment. Each Colour carries the number of the battalion in the centre of the Queen’s Colour and in the upper canton nearest the Pike in the Regimental Colour. Both Pikes are surmounted by a gold crown surmounted by a crowned gold lion. 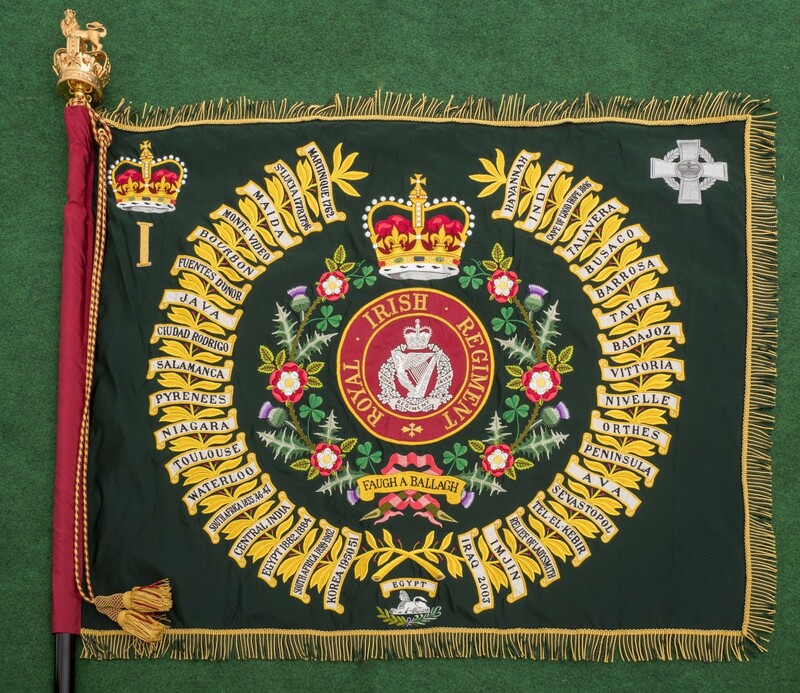 The regimental motto on the Regimental Colour is Faugh a Ballagh, a transliteration of the battle cry in Irish (Gaeilge), - Fág a’Bealach, meaning - Clear the Way!